A Flowery Welcome To October. 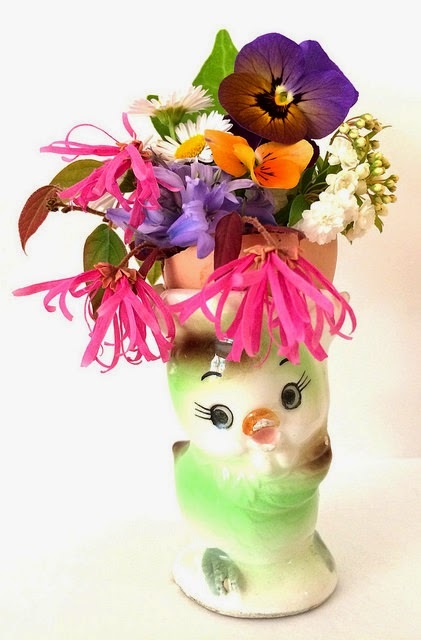 I've been thinking of doing flowery blog posts on the first day of each month. After all flowers are such a wonderful cue for the changing seasons, they make a wonderful welcome tribute and most of all it's always fun to play with pretty blooms. My plan is to be a bit creative with these posts and throw in something quirky, a twist you might not have seen before. The perfect vessel for tiny little blooms. So light they practically float in branches. In the end I took them outside and left them as a gift for the birds or faeries. My welcome gift to October!! 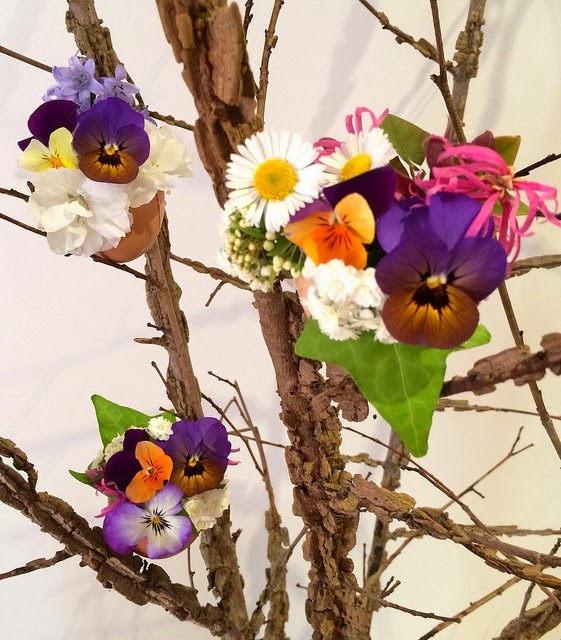 Flowers used: Pansies, Fringe Flower, May Bush, Seaside Daisies, Ivy leaves and the dry branches are Corky Elm. Oh, I love this idea Rachael! 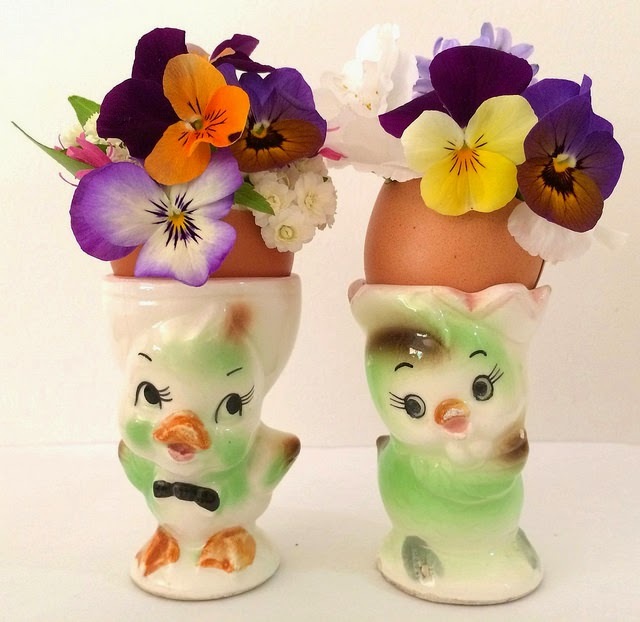 The egg cups and the eggs make such perfect vases for the pansies and daisies! I look forward to more floral fantasies next month! The egg vases are a wonderful concept. I'm trying to remember where my egg cups are packed. I see tiny posies all over. Great idea Rachael, and the daisies and pansies look so pretty in them. Love the bright colours of the pansies. My fairies wouldlove some of those flower vases - must get to work! Thanks for the idea!! just little bits of sweetness! So sweet, dear Rachael - what a great idea!!!! Such a beautiful post to wake up to this morning! I love those fringe flowers ~ have never seen them before. And the little white balls. What are they? I'm going to remember that egg idea! So Creative! They are wonderful! Beautiful post Rachael. I love your idea of a monthly post about flowers. 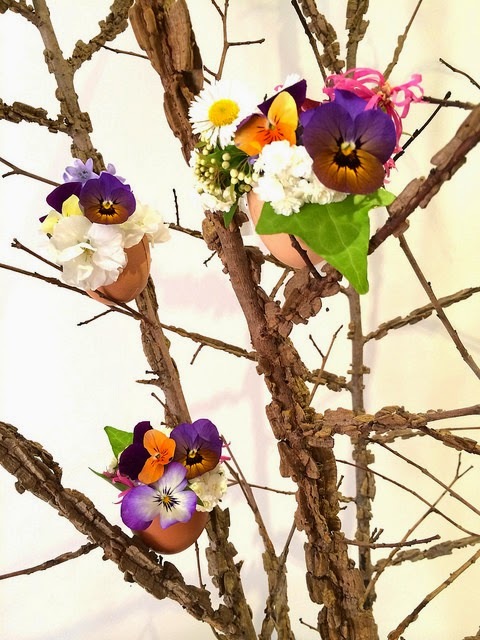 How did you manage to keep those egg-vases stable on the branches? Did you glue them? 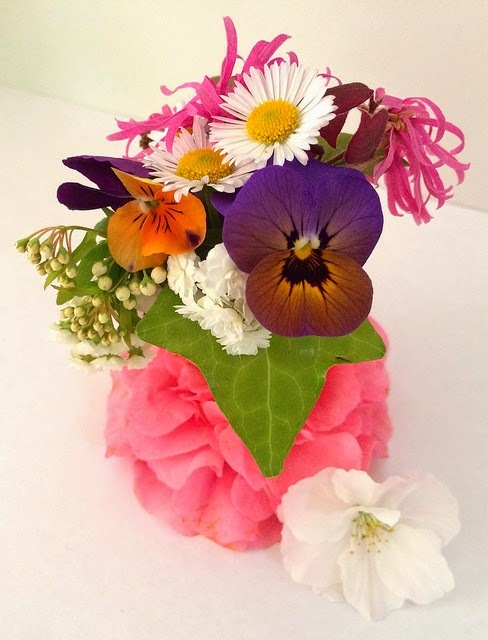 I love the idea of flowers at the start of each month and look forward to seeing your beautiful creations. love love love those egg cups! They are so quaint a pretty! Some of the blooms I have not heard of...native to Australia? Thanks for sharing this great little idea. This is why I love your blog so very much!! You must have very happy garden fairies! These are just delightful. In reply to Sujata's question of how I kept the little arrangements stable in the branches -I just nestled them into the branches. There was one that I used a bit of clear sticky tape to help support it. The great thing about the Corky Elm branches is that their rough texture helps hold things in place. And Kelly asked if the flowers are native, None of these flowers are native to Australia, I think some originate from China. haha, did a double take and then I realized just Where you are :) we are headed for frosty days and frosty nights but that's OK......we've got red and yellow leaves. Nice job. Beautiful blooms and the floating arrangement looks amazing. 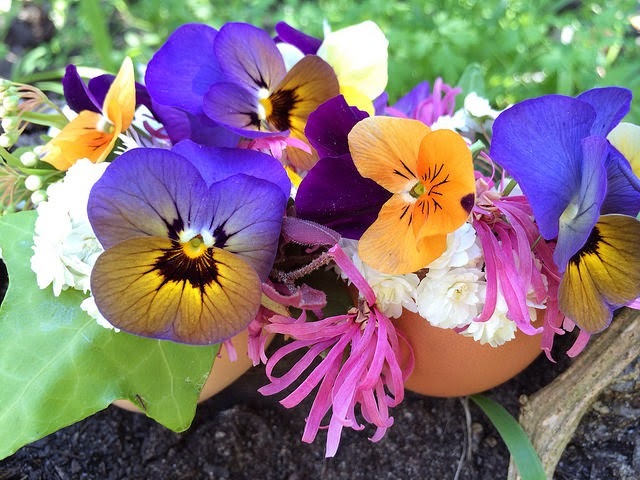 What a pretty little bouquet in an eggshell, which came from your own chickens I bet. The little egg holders are super cute too. 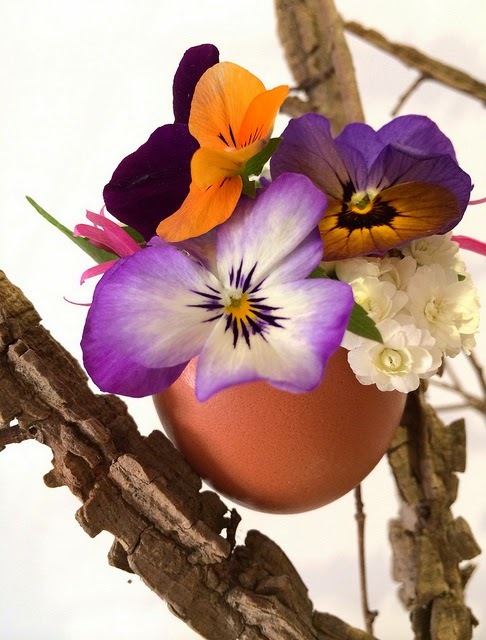 Your tiny egg vases are as fresh as the flowers. The colors in the pansies are beautiful. 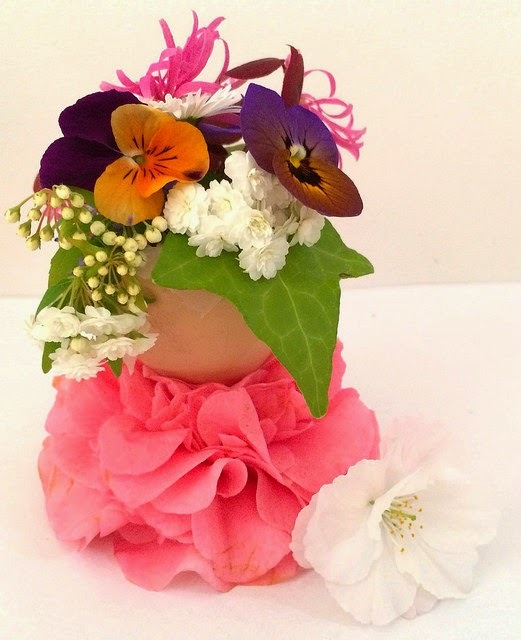 Thanks for sharing your floral designs. What a lovely Spring idea...too bad Autumn is arriving here. Will have to save it for next year. Thanks for the inspiration. I love this botanical feast for the eyes. Great vintage chicks too. Cute! I've never seen fringe flowers before - I'm guessing they are the pink ones? Are the small white bunches of flowers a version of the banksia rose? What a delightful post! How you think up such ideas amazes me. The colours are gorgeous and I am still puzzling how the eggs didn't topple over. Fairy magic perhaps? so sweet and creative! 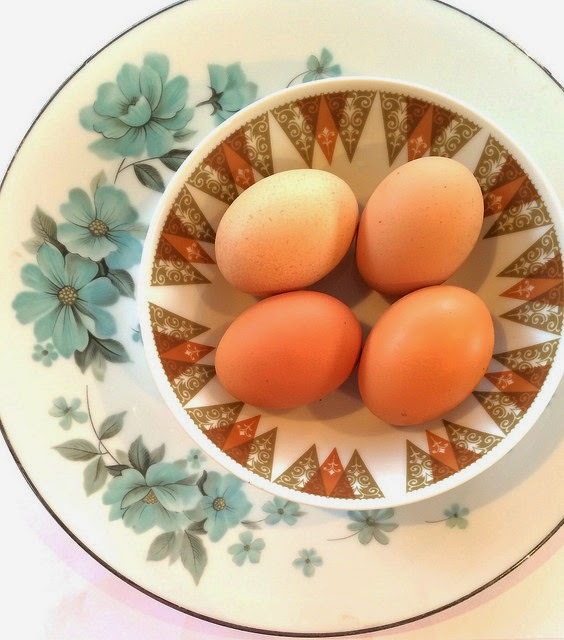 I love the egg holders, very vintage and fun. so funny that you have spring flowers while we're turning autumn. 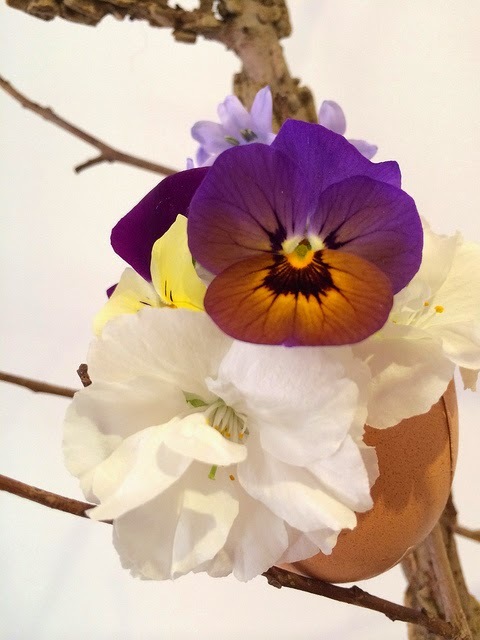 pansies are one of my very favorite flowers! Our dear girl would love these. As you know she's got a thing about flower arranging and now she collects our eggs. Perfect match. I will be sharing this post with her. OMG Rachael I LOVE that purple and gold pansy...it's just beautiful....I'm sure the faeries will love it too! You are so creative! I enjoyed all your beautiful photos and the names of the flowers you used (there are some new ones that I have not heard of before!). Lucky birds and faeries! Just gorgeous. 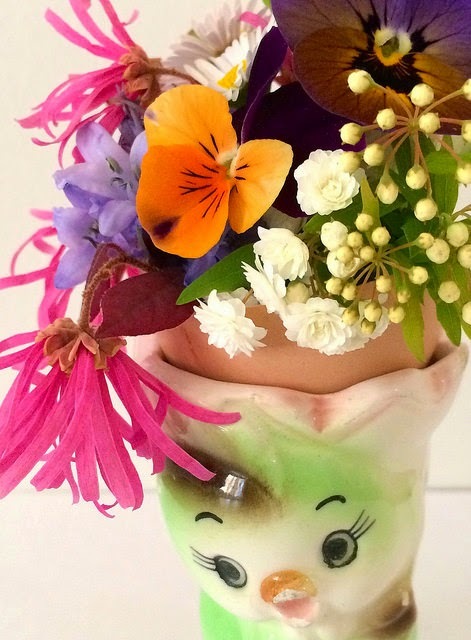 What a clever idea for vases and a great way to showcase cute egg cups as week as the flowers. I really enjoy seeing lovely floral arrangements as I definitely don't have the knack. I wonder what you will do next month? So pretty! You always bring a smile to my day. Happy October to you too! Gorgeous! Hope the birdies appreciated them as much as we did!! Those pansies are so springy!